Richard C. Reno, M.D. is board-certified by the American Board of Pediatrics and has been practicing at the White-Wilson Destin Clinic. Before moving to the Emerald Coast, Dr. Reno was a pediatrician in the United States Air Force for over 14 years. Dr. Reno received his medical doctor degree from the Uniformed Services University of the Health Sciences in Bethesda, MD, and completed his internship and residency in Pediatrics at Kessler AFB Medical Center in Biloxi, MS.
Dr. Reno specializes in pediatric care with a focus in ADHD management. 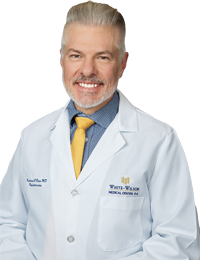 He also specializes in wellness care; preventive medicine; sick childcare; diagnosis and treatment of acute and chronic illnesses; and sports physicals for young children until the age of 18.